You know, the odd thing about being so used to the academic calendar is that after a while, grading lots of papers starts to feel a little bit festive. Like Egg Nog. (Except, you know, not). And the interesting thing about reading through stacks of papers is that it starts to make the otherwise boring, navy, stockinette 80-sts-on-2.5mm-needles gift socks start to look really, really fun. 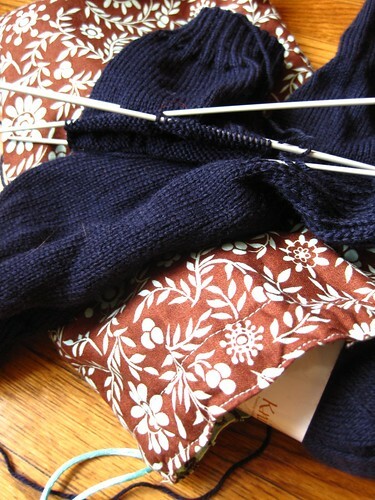 There may be hope for the gift knitting after all. this is an angle to grading i had not considered, given that this is the first semester where i have a pile of grading to work in addition to my own papers. this may really help with my holiday knitting…but will it aid my grading? That’s what I call putting a positive spin on things. Procrastination, done properly, is an art form. As we are getting a reminder of what cold is here in Minnesota, too, I’m eyeing your gift socks enviously. The sign of a truly experienced grader is when you can knit *while* reading student papers! Of course, this works only on the final papers, when you don’t need to write a zillion comments 🙂 I always knit socks while I give exams. It gives me something to do while the llittle dears are working away, and I can keep an eye on potential cheating without looking like I’m watching them. Unfortunately, I have been assured it would fall under the category of “needlessly freaking out candidates”. Darn. Hang in there! Almost Winter Break. I can imagine how grading so much beforehand can be daunting, though. I sometimes reach a slap-happy, almost drunk stage in the midst of a grading frenzy! Oy, good luck with the grading. I love navy blue and therefore those socks are beauties. (I always reach for the plain stockinette socks first, always) but wait… 80 stitches on 2.5mm needles? man socks? oh mercy. Or you can just use the dpns to stab your own eyes out… which is what reading big stacks of papers makes me feel like doing! I feel your pain. the socks look fantastic! i always enjoy plain stockinette, although i admit to never knitting solid color socks. good luck with the holiday knitting!! !